Fabulous selection of clothing and accessories 50% OFF, look for RED DOTS -- plus great markdown selection 60-75% OFF. Making appointments to bring in your SPRING and SUMMER 2019 fashions. We can't wait to see what you have for us! PLEASE call for an appointment first and remember: quality is better than quantity! 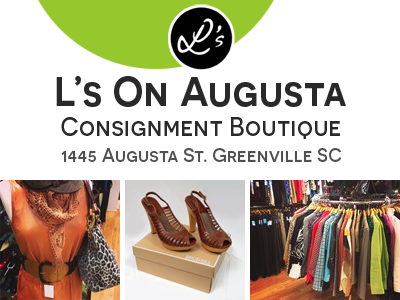 Ls On Augusta -- Womens clothing consignment, new and gently worn name-brand designer labels and fashions of the highest quality, thats what its all about! Ls has womens clothing, scarves, handbags, shoes, jewelry, and lots of accessories. Womens fine consignment and accessories shop located at 1445 Augusta Street, Greenville SC 29605.